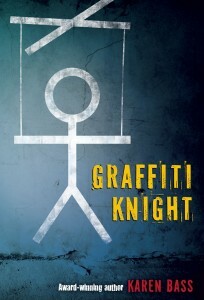 Graffiti Knight by Karen Bass has been honoured by the United States Board on Books for Young People (USBBY) as one of six Outstanding International Books for grades 9–12 in 2015. Books that provide a perspective or address a topic otherwise missing from children´s literature in the U.S.
Graffiti Knight has already received a number of significant awards, including the CLA Book of the Year Award, the Geoffrey Bilson Award for Historical Fiction for Young People, the R. Ross Annett Award for Children’s Literature, and the CAA Exporting Alberta Award. Pajama Press congratulates author Karen Bass on yet another well-earned accolade. Click here to view the full list of 2015 selections.